For a less expensive stay, a Melbourne serviced apartment is cheaper than a hotel. It can give you flexibility combined with the service of a Melbourne hotel. Many of the apartments take advantage of prime locations with panoramic views. Executive serviced apartments similarly can give travelling business person the comfort of a home away from home. For secure bookings and guaranteed best prices for any type of accommodation, ranging from small independent hotels to a five star luxury, you can book your hotel here - No Reservation Fees! As a travelling family serviced apartments or holiday homes will give you the opportunity to live in Melbourne for your time here, rather than just stay as in a hotel. Apartments are generally serviced, but they also allow you to do the cooking and washing like at home. You can save yourself a lot of money staying in a holiday apartment with a comfort that is hard to find in a hotel room. You can find very reasonable priced budget apartments as well as expensive luxury homes. 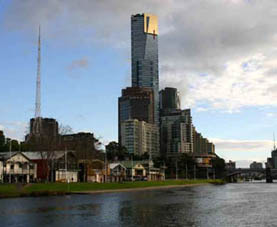 Melbourne Hotel or Serviced Apartments for the Executive? As a travelling executive you may also prefer the option of a serviced apartment. It feels more at home and is less expensive. You can find many beautiful apartments with high quality interiors, broadband connection & interactive TV, servicing and integrated kitchen and bathroom. At the top end, there are the luxury apartments with high quality leather sofas, luxurious king size beds and all the furnishings to be expected in a luxury home. For any extended stay I would absolutely recommend staying in a serviced apartment! Especially if you choose one in an attractive location with great river, city or bay views.